The Soviet T-38 tank was designed to be an Amphibious light tank that could ford the many lakes, rivers and swamps that are found in the Russian plains. This example can be found on display at the Central Armed Forces Museum in Moscow, Russia. To get to the Central Armed Forces Museum in Moscow you will find it in the road called Ulitsa Sovetskoy Armii in the north of the city to the left of the Olympic Stadium. The nearest metro station is Dostoevskaya. It was designed between 1934 and 1936 by Nicholas Astrov and N Kozyrev at Factory number 37 in Moscow. It entered production in 1936 and stopped being manufactured in 1939. Around 1,500 T-38 tanks were produced. 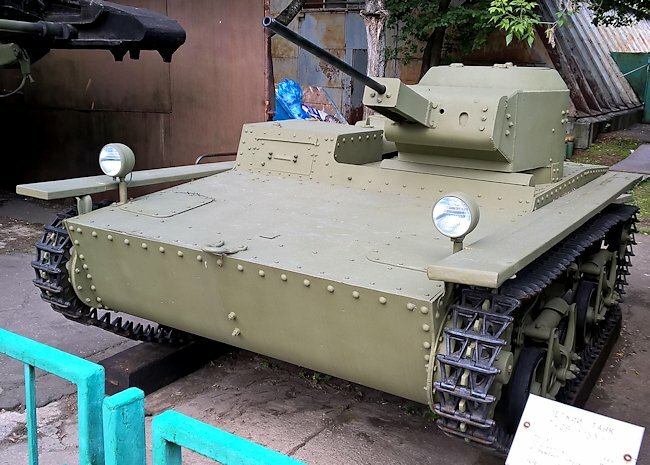 They were armed with a 7.62mm Degtyaryov DT Machine gun but a few, like this tank, were tested with a 20mm ShVAK Aircraft Autocannon and given the model number T-38Sh or T-38 ShVAK. The first one was tested in August 1941. 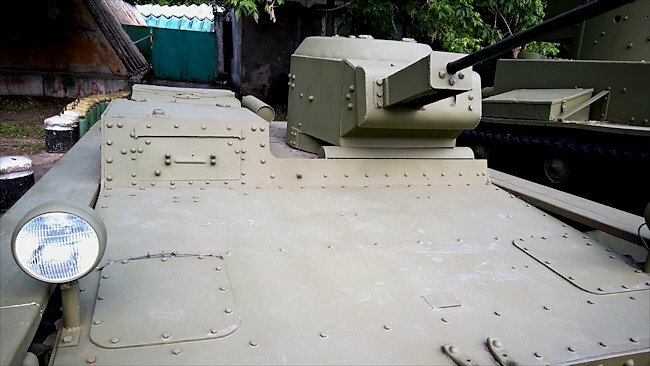 Only two prototype vehicles were armed with the 20 mm gun but neither saw active service. 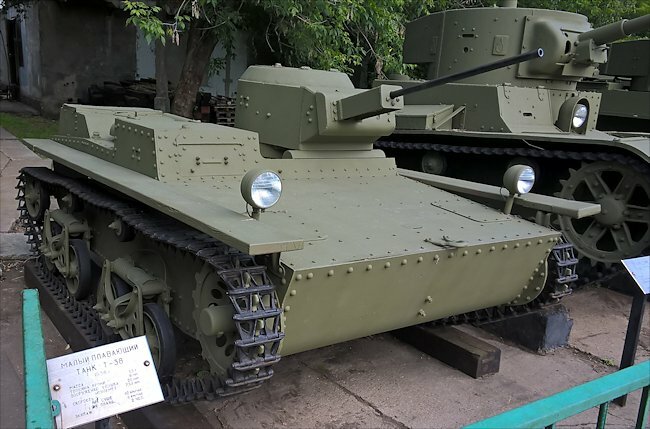 The Sh or ShVAK abbreviation was for Shpitalnyi-Vladimirov Aviatsionnyi Krupnokalibernyi (Shpitalny-Vladimirov's large-calibre aircraft gun) The T-38 ShVAK Amphibious Light Tank proved difficult to use operationally because of the cramped internal compartment and the project was dropped. Only two were built. The T-38 tanks were powered by a GAZ-AA 4 cylinder water cooled 4 stroke L-head petrol engine which was a Russian copy of an American Ford Type AA engine. It produced 40 bhp and gave a top road speed of 40 Km/h (25mph). The engine was cheap to produce and maintain. The tank had an operational range of 250km (155 miles) and 190km (118 miles) off road. 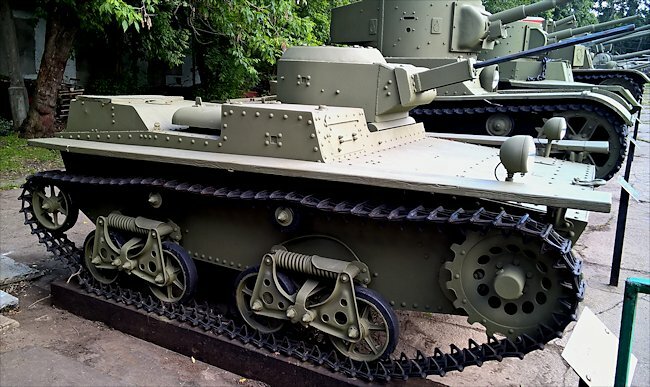 These light tanks were designed to fulfill the role that used to be undertaken by the Calvary. Their purpose was to probe enemy lines and find out their positions and send the information back to headquarters and artillery units as fast as possible without engaging with the enemy. The armour on these small tanks was only thin. It ranged from 3-9mm. This was barely enough to keep the two man crew safe from small arms fire. Its predecessor the T-37 tank was based on the French AMR 33 light reconnaissance tank and the British Vickers amphibious tank. A large volume hull and fenders were added to the tank body to provide buoyancy. Propulsion in the water was provided by a three bladed propeller mounted at the rear. It's very low profile made it easy to camouflage and hide making it difficult to spot and hit. What is strange is that radios were not fitted to all these reconnaissance tanks. Only 607 T-37 and T-38 tanks were fitted with radios. Those without radios were expected to head back to their own lines to hand over the intelligence they had obtained. Their thin armour and poor armament meant that they were not suited to tank on tank clashes. They were not designed for that role. Even the Finnish Army's rifles and machineguns could penetrate the armour of a T-38 tank if cornered at close range. They were totally outclassed by the end of 1941 after the German invaded Russia as part of Operation Barbarossa. The last recorded use of the T-38 on active service by the Red Army was in the Summer of 1944. Many were captured by the German army and some were converted to anti-aircraft self-propelled guns that carried a 37 mm gun and used by the Luftwaffe for guarding their advanced airfields. Where can I find other T-38 Amphibious Tanks?